If you’ve been following my blog, you’ll notice that I usually feature a food photo at the beginning of a post. 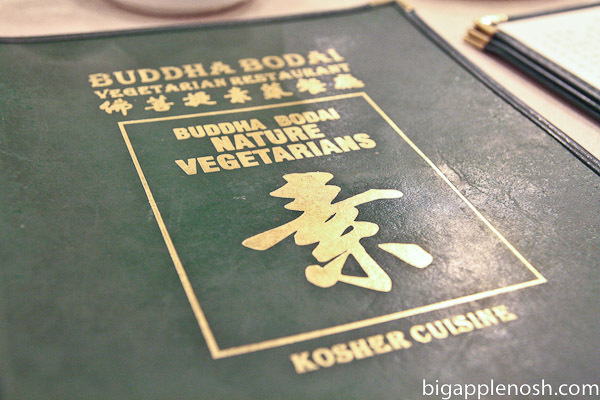 However, I could not resist after visiting Buddha Bodai Nature Kosher Vegetarian Restaurant. I mean come on. How cool is that name? It’s Buddha approved. It’s all about nature. It’s vegetarian. AND it’s kosher? Geez, Louise. I know some people rely on mock meat and relish it. I’ve tried it, and some of it is indeed uncannily similar in texture to the real deal. I just can not wrap my mind around mock meat though, try as I might. If I’m going to eat at a vegetarian restaurant, I wanted to savor the veggies, not the mock duck. That’s just how I roll, kiddos. 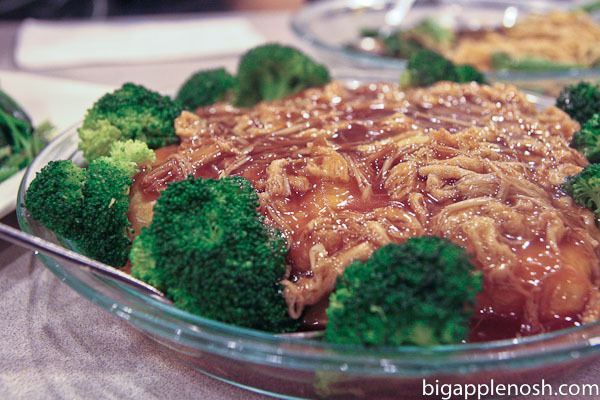 Covered in savory brown sauce, I did like this dish quite a bit. The egg white (on top) provided a blank slate to absorb the sauce, and the tofu underneath was silky smooth. While I didn’t partake in the broccoli with as much gusto as I should have, this dish was thoroughly A-OK. I mean, to be honest, I’m not sure how much healthier this dish was, as the sauce was quite salty and I’m pretty sure there was a corn starch thickening agent hiding out somewhere. But from a pure taste perspective, this wasn’t bad. Not to fear! Pea pod leaves are actually one of the yummiest green veggies I’ve ever tried. Tender, flavorful and not stringy at all, pea pod leaves are almost always helped with some garlic and oil. Hrmmm, ok so it’s not AS healthy anymore with the oil, but I’m still taking credit for eating veggies, mmmkay? If you’re as skeptical about veggies as I am (or even if you’re not), I’d definitely recommend trying pea pod leaves if you have the opportunity. 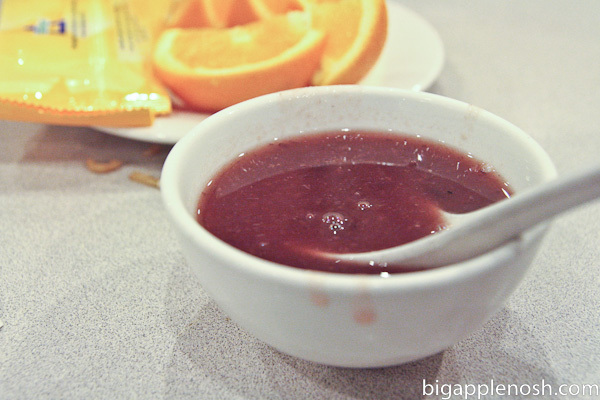 We finished off with the requisite oranges/wet naps/red bean soup combo. For the uninitiated, red bean soup is a pretty standard Chinese restaurant dessert – it is sweet, mealy and pretty mild. I’m generally not a fan, but this version was quite tasty. While I wouldn’t consider this the best meal I ever had, part of that sentiment can be attributed to my general apathy towards vegetables. However, if I had to have vegetables, Buddha Bodai is a pretty good option. Not bad, even for this avowed veggie-averse. What do you think of this concept? Would you try it? I would definitely try this place. I'm not the biggest fan of mock meat either, except for fake sausage, which I'll throw into veggie paellas for my husband and I to share. The noodles you ordered look pretty good! 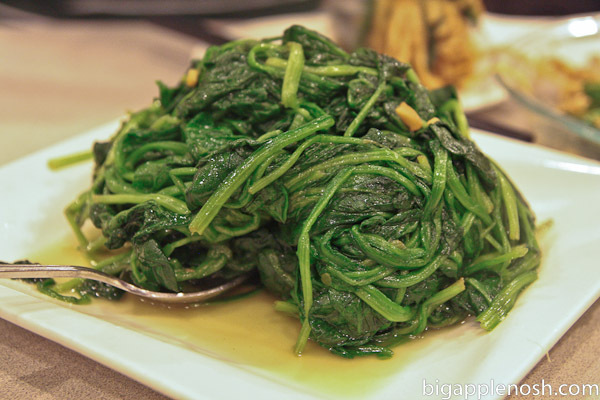 I think I can be convinced to eat pea pod leaves…only if smothered in that yummy garlic oil. 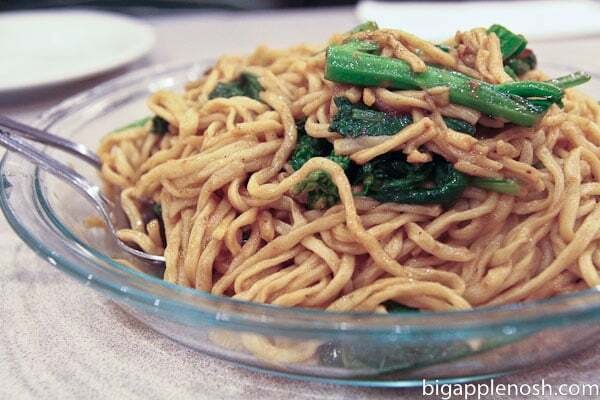 Mmm tofu, pea pod leaves, and noodles? Yes please! I'm a weirdo who loves mock meat and almost anything green and leafy. I love veggie Chinese restaurants! I'll have to check out this one. Veggies!! nom nom nom, but I would have to dine alone as I'm the only veggie addict in the friends/family circle. Ha! The first two dishes look really good. Aww I'm saddened that you don't like fake meat. It's much better if you consider it an entirely different genre of food as opposed to wanting it to taste like meat. LOL. your reluctance to eat vegetables at a vegetarian restaurant astounds me. it doesn't really. i just wanted to say that. I can't do mock meat! But I'll eat veggies all day and those noodles look great.